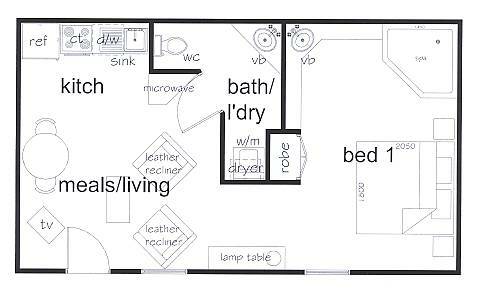 1 Bedroom Suites, Queen-size Bed, Bathroom & Spa. These three studio apartments lie behind a wisteria covered veranda, which opens onto a large, covered, north westerly facing terrace. The terrace is furnished with a number of outdoor lounges and BBQ facilities making it a delightful place to relax, bathed in soft afternoon sunlight, overlooking the historic mill buildings and gardens. Each studio apartment, while similar in design, is individually appointed. The Terrace Apartments: Curdie (Blue Door), Talindert (Green Door) & Wiridigil (Red Door), are named after the magnificent homesteads of the early pioneering families.